Powerful in Paraiba Tourmaline . . .
Suna Bros. Paraiba tourmaline and diamond engagement ring. Such a powerful statement of love in Paraiba tourmaline, which is among the world's rarest of gems. This positively gorgeous platinum ring is from Suna Bros.
Aaaahhhh, Aquamarine . . .
Costis Jewelry aquamarine and diamond engagement ring. Lovely in Labradorite . . .
Danhier's ladradorite engagement ring with halo of blue sapphires and diamonds. Engagement ring from Danhier in 18K white gold with labradorite center stone and halo of white diamonds and blue sapphires. Captivating in Blue Chalcedony . . .
Pasquale Bruni blue chalcedony and white diamond ring in 18K rose gold. Blue chalcedony is the focus of this 18K rose gold engagement ring from Italian luxury jeweler, Pasquale Bruni. It's from the brand's famous signature "Bon Ton Collection." Outstanding in Opal . . .
Pamela Froman Fine Jewelry opal ring with Paraiba tourmaline in 18K rose gold. Pamela Froman Fine Jewelry takes the traditional October birthstone, opal, and sets it into one of her signature "Crushed" texture 18K rose gold engagement ring designs that's anything but traditional! Riveting Aquamarine Rosecut . . .
Eva Stone rosecut aquamarine engagement ring in sterling silver and plated gold. A rosecut aquamarine--the lucid blue birthstone gem of March-born girls--is bezel-set in this edgy beauty from Eva Stone. It's an unconventional engagement ring of oxidized sterling silver and gold plating. Tantalizing in Tanzanite . . .
Pamela Froman Fine Jewelry tanzanite and diamond 18K gold engagement ring. A roundrich-hued purpley-blue tanzanite is the "star" of this 18K rose gold engagement ring by Pamela Froman Fine Jewelry. A halo of white diamonds surrounds the vivid colored gem. Creatively Cut Aquamarine . . .
Symmetry Jewelry's aquamarine engagement ring in sterling silver and karat gold. Featuring a creatively cut aquamarine, Symmetry Jewelry makes this engagement ring for the contemporary bride who loves unique. In a combination of sterling silver (on the shank) and karat gold (for the bezel), it's an easy-to-wear ring for the newly married modern woman. The Panache of a Blue Pearl . . .
Yvel engagement ring with a blue baroque pearl. A blue pearl? Well, if you're thinking of a pearl engagement ring, you won't find anyone else wearing this! From Yvel, the 18K white gold ring holds this one-of-a-kind baroque gem. A Totally Awesome Tanzanite Trio . . .
Lauren K.'s 18K gold engagement rings with tanzanite cabochons and white diamonds. From Lauren K. Fine Jewelry, which specializes in wearable jewelry that's luxe with a bohemian flare, here's a trio of tanzanite cabochon engagement rings. All are in 18K yellow gold. Incredibly different and daring for the bride-to-be who wants to do it her way! The Luxe Look of Lapis . . .
Dyanne Bell Jewelry's lapis-lazuli and citrine ring in sterling silver. A marquise-shaped lapis-lazuli center stone in this out-of-the-ordinary (and affordable) engagement ring is striking side-by-side a halo of yellow citrines. It's from Dyanne Bell Jewelry, created in sterling silver. Breathtaking in Blue Topaz . . .
Erica Courtney's blue topaz and diamond engagement ring in 18K gold. In blue topaz, Erica Courtney's 18K yellow gold engagement ring is majestic--and when looking at it from every angle, too! With plenty of white diamonds, it's a fantasy ring, yet just perfect for the woman who's looking for that undeniably distinctive bridal ring. Cigar Band Style in Blue Topaz . . .
Katie Decker 18K gold cigar band engagement ring in blue topaz and diamonds. Evoking that definite retro feeling are cigar band style engagement rings. This one in 18K yellow gold by Katie Decker features vivid-hued blue topaz, with plenty of white diamond accents. Pretty in Paraiba Tourmaline . . .
Suna Bros. 18K gold engagement ring with Paraiba tourmaline and diamonds. 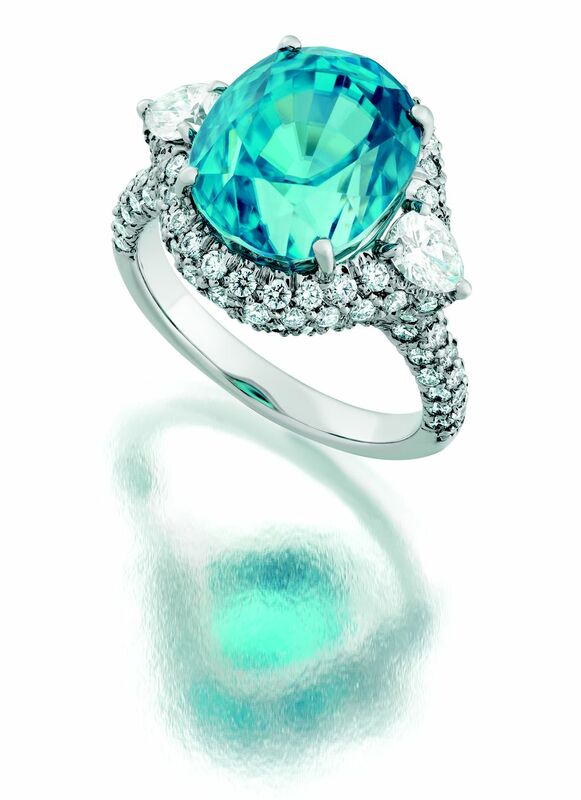 Suna Bros. oval cutParaiba tourmaline gemstone (with a four-prong setting) has a halo of white diamonds. In 18K yellow gold, this is a highly original ring for a bride who wants her "forever jewelry" to become an heirloom. Awesome in Aquamarine . . .
Samantha Louise Design's aquamarine engagement ring; and black diamond wedding band. From Samantha Louise Designs, this edgy aquamarine engagement ring is in understated darkened sterling silver with white diamonds on the shank. As you see, the brand makes a similarly designed wedding band in oxidized sterling silver with black diamonds. You can get either ring with white or black diamonds. Bedazzling in Blue Topaz . . .
Roberto Coin engagement ring in 18K white gold with blue topaz and white diamonds. A traditional round blue topaz sparkles in this 18K white gold and diamond engagement ring from Roberto Coin. The Italian luxury brand is globally recognized for its bridal as well as its fashion jewelry.